Seems the cat is out of the bag! At the Specialty Coffee Association of America (SCAA) show in Seattle last week the owner of the company "spilt the beans" that there was a new version of the very popular roaster planned for release soon. Within hours the Internet was abuzz with noise and speculation about the new roaster and it's features. So I'm assuming that my Non Disclosure Agreement (NDA) is now open for discussion... so here it is. 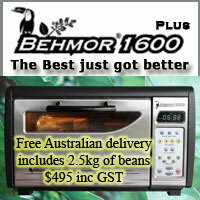 We are lucky enough that the world's first build of the new roaster is the 220v/240v Australian model. The roasters have been built and are on the water and I hope that they will land and clear customs and will be shipping out to anxious customers before the end of May. ​0%, 25%, 50%, 75%, 100% selectable element power. I'll update this thread as needed. I've been running the new roaster for a few months and it's really great to get the extra control. Any questions feel free to fire away and I'll do my best to answer them. @3aan, grendel, matth3wh and 3 others like this. I presume it is still possible/practical to install a temperature probe for linking through the DMM to the Roast Monitor software? Interesting... After leaving a roast unattended in Oct-12, I think I killed something above the drum which extracts the smoke (Is there an element up there?). I didn't bother replacing it because I'm still roasting OK, but I don't think Behmor is getting up to the same temps as it used to, and, on average it's taking longer to reach 2nd crack. I've done over 300 roasts, so this is sounding like a good opportunity for a service and upgrade. Is there someone who can do this? I'm in Sydney. The temperature readings on the new panel are only active after 54C (it treats everything under 54C as 54C). It does that because under that temperature the probes are not as accurate and besides, it doesn't really matter as nothing roasts at that temperature. You certainly could use the CS meter and Roast Monitor software, the beauty now is that you would be monitoring profiles that you can fiddle with manually. With Roast Monitor you could do a manual roast, save the profile, load it up again later and manually adjust to duplicate the roast. Roast Monitor makes more sense with this model of Behmor. but it sounds like you burnt out the afterburner when you left the roaster unattended (red elements in the ceiling of the roaster). You can test the afterburner easy, plug the roaster in, hit cool and the afterburner should come on for the first couple of minutes of the cooling cycle. If you do want to purchase a replacement afterburner for your 4+ year old roaster, contact me off-line before buying the upgrade kit. so this is sounding like a good opportunity for a service and upgrade. Is there someone who can do this? I'm in Sydney. The "Behmor Plus" upgrade panel is a fairly easy replacement. 15 minutes and a couple of philips-head screwdrivers is all it takes. I'll post up an installation "cheat sheet" when they land so people can follow it... but the installation is pretty intuitive. So Andy the price remains the same? I'll be even more keen to get one if it does, I've been holding off for a while. The roasters have been built and are on the water and I hope that they will land and clear customs and will be shipping out to anxious customers before the end of May. O man... will they arrive during MICE? Doubt it; the Plus will be $500 in the US (compared to $300 for the standard, which I believe will continue to be available there). This is definitely great news, and the $60 price for the upgrade kit seems very good value for adding fantastic functionality. Reading the (admittedly very high level) instructions on the upgrade page on Beanbay, it doesn't mention anything about installing temp probes, so does this mean the original 1600 has temperature probes already installed? Or are the side wall and exhaust temperature probes part of the upgrade kit? Thanks Andy. That sounds great. This is definitely great news, and the $50 price for the upgrade kit seems very good value for adding fantastic functionality. The chamber wall and exhaust channel temperature probes are already in the roaster, including the original model. The new control panel simply allows you to see what their readings are. Hi Claudio, and welcome to CoffeeSnobs! directly via the 'contact us' function at the very bottom right of each page. Bean Bay is not set up to deal directly with overseas customers. for one to be manufactured. You could also try contacting Behmor customer service direct? p.s. Your English is fine!! Is the unattended mode just for manual roasts? Could be annoying if I'm using one of the built in profiles. This is great news though! Yes, it will happen on all roasts. The unattended 30 second count-down is a SAFETY feature. The roaster needs to know you are still in front of it, still awake and concentrating on what you are doing. Pressing the [Start] button isn't a huge burden but it does ensure that you are there during the period that bean ignition could happen. The roaster has always had "Do not leave unattended" written on top of it and on every other page of the manual yet from time to time we hear about "while my roaster was unattended....". We really want everyone to enjoy great coffee instead of dealing with a bean fire in the roaster! For sure! For those that have cracking the door open at first crack and other similar workarounds you will be able to switch to manual controls and lower the heat at first crack instead which should produce far more consistent and repeatable results. Joseph Behm the inventor and owner of Behmor is coming over for the Melbourne International Coffee Expo (MICE) and has organised airfreight for a small pile of roasters. I've heard from the freight forwarder that they will clear customs on time so YES... those attending MICE will be able to meet the inventor and take a roaster home with them (first in, best dressed, cash and carry, no reserves). The full shipment is on the water and will arrive and clear customs in the next fortnight odd so those that can't attend MICE next week will only have a short wait till their new Behmor Plus roasters ship from the Snobbery. The front panel upgrades will arrive in the same container and be available at the same time. Damn, I wish i was attending MICE now. I had the week off even coincidentally. Does the container have enough that you don't expect to sell out Andy ? I have a piece of string... how long is it? That's really a loaded question, we always land more than we can sell instantly and we hope to never run out but at the end of the day it's always a best guess. The people that have contacted me to go on the waitlist will be the first to be notified when "I can touch them" and we should have enough after that to post them in BeanBay for those others that are quietly waiting in the wings (but I can't guess how many people that is). amellor, chron and filobiblic like this. Thank so much Andy... I'm a homeroaster because I love coffee (of course, I'm italian.. ) but paradoxically here, in Italy, is very hard to find help for this (roaster, green beans etc). Then I look out of Italy (Deutschland, England, U.S.A and Australia -my uncle lived until 2012, now is died, in Adelaide...) where homeroaster business is more developed. My behmor work at 230 volt. I will try to ask information on Behmor and I will inform you (I really hope they can satisfy my request). Maybe I don't write many times but I will continue to follow your forums with respect and passion. The good news is that it's the same front panel upgrade! The 220v, 230v and 240v all use the same front panel so it will work fine on your roaster. The USA have different voltage and a different front panel but will have the same functionality as this one when it's released. I am curious when should the drum speed come to play in the roast cycle and how it will affect bean temp. I suppose the 180 second max preheat is still the limit. Home roasting is a lot of fun, regardless of what other people are doing you should learn what works best for you and your tastebuds and not get hung-up on the micro-science of the process. My kids won the best home roasting category in the Golden Bean competition two years in a row by keeping it simple... start with a room temperature roaster, weigh the beans, set the profile and then use the "Rosetta Stone" guidelines to reset the time remaining when they heard first crack. Simple process and the results can be amazing! From time to time I read all sorts of weird things about what you "have to do" on the Behmor, most of these are adding odd, uncontrollable and unrepeatable variables to your roasting process. Pre-heat is mostly unnecessary, cracking the door at first crack is random at best and a lot of other so called tips are just complicating what can be a fairly simple process. One of the problems with Internet education (and ergo, regurgitation) is quite often you are reading content posted by someone with different tastes, in a different climate and in the case of the Behmor different roaster voltages. In the USA the home supply voltages can vary from 100v to 125v which is a big percentage, typically in Australia the voltage differentials are a much lower percentage. Ambient temperature plays a big part on the roast times for any coffee roaster. For the same given weight, cold air into the roaster needs heating so in a warm environment it will progress faster, in a cold environment slower so copying roast specifics from someone in the tropics when you live in Tassie makes no sense. I always suggest that people learn to roast from the basics and then develop your own set of "rules" that work best for your tastes, on your equipment and in your own environment. The new Behmor Plus adds manual controls which if used right should give you the tools to achieve a more consistent result. Eg: you could pre-heat if you wanted and stop the heating at measured 60C chamber wall temperature... that would be repeatable. Pre-heating for a time period is random at best. Instead of opening the door for a time period at first crack you could set the elements to a lower manual power setting for a specific time or temperature reading which would be far more measurable, consistent and repeatable . Consistency and repeatability should always be key in your coffee roasting journey. The temptation to make a 1000 changes in every roast is even more likely with the new manual controls so I suggest only making one change at a time and TASTE the difference it makes to your roast. Keep lots of notes on the weights, settings and most importantly the taste and in no time you will build a reference that will yield excellent coffee every time you roast. It's vital in home roasting to "cut your own path" through the piles of information and misinformation. Most of all, enjoy the journey. It's a great hobby and the results can and should be amazing. aaronpratt, amellor, coffeechris and 12 others like this. Thanks for reading it and I'm glad you could glean something from it too. Take it as just "another rant from Andy" or some wise words from someone with 100's of tonnes of roasting experience on many different roasters... either way it's all the truth and I'm sure your home roasting journey will be better for taking the time to read it! so I suggest only making one change at a time and TASTE the difference it makes to your roast. by the way, the top is not only for roasting, also for making the espresso... if someone changes to many things at a time, he/she dosn't know at the end, what was the good and what was the unnecessary. those attending MICE will be able to meet the inventor and take a roaster home with them (first in, best dressed, cash and carry, no reserves). Will there be any left by the Saturday? Ummm.... how the heck should I answer that? YES sure, there will be plenty left on Saturday. NO chance, they will all be gone by then. ...one of the above statements is true and you and I won't know which one till Saturday!!!! If someone is creative they might ask if there will be a demo unit for sale after the show? Ambient temperature plays a big part on the roast times for any coffee roaster. For the same given weight, cold air into the roaster needs heating so in a warm environment it will progress faster, in a cold environment slower so copying roast specifics from someone in the tropics when you live in Tassie makes no sense. Though I still wonder how drum speed affect the roasts. A quick google search brought me to a forum posts from people with big boy roasters, and all I got is that it aerate more (well duh?!). Since the 1600 heating element is at the back, does it drag the beans higher towards the back and heat up the beans faster? Similar to those who put a block of wood below the door. Also, how would one get the bean temperature from chamber wall and exhaust temp? Humidity while roasting has a minor effect considering that most of the roast the bean temperature is higher than water boiling point. ...Since the 1600 heating element is at the back, does it drag the beans higher towards the back and heat up the beans faster? Yes, that's what is does. Simply pressing the [A] and [B] buttons during a roast on the Behmor Plus will show the temperatures. No no, I mean, how do we get the temperature of the beans from those 2 numbers? Is there a formula? Or just logging those numbers during the cracks and be ready for the same (similar?) stats for the next batch? Dammit, they're all sold out already! Any idea when the next batch is going to land? Nope- Andy has yet to add stock as they haven't arrived yet. just logging those numbers during the cracks and be ready for the same (similar?) stats for the next batch? Yes. Given the same weight of beans, the same ambient conditions and the heat application the temperature of the chamber wall will be a reference to that part of the roast profile. All this is useful data if you don't make too many changes at once. my afterburner blew out ages ago, never really worried about it, the light went too 18 months or so ago, so I will be ordering an upgrade panel and will organise an afterburner and bulbs? to go with. I assume for those of us on the wait list for the "old" 1600 will be auto migrated to the wait list for the 1600 plus? Just want to comment on the pricing, I have read on other websites in other countries some asking for up to USD$100 more for the upgraded model, while at Beanbay it is a little over AUD$50. So just a quick thanks to Andy for the non gouging pricing practice of this and other products on Beanbay esp greens. If there is a waiting list for the upgrade panel Andy, can you add me please. Pretty please! Thanks for noticing Jonster. We always have and always will try to keep things fair. It's often a struggle when you are importing as the fluctuations in the AU$ can really add to the bottom-line with a multiplying effect. Things like duty, GST and clearances are all calculated at the time it arrives against the invoice price in US$, not the what the dollar was when we purchased so often those sneaky costs can jump 5%-10%. The AU$ is 10% lower than last shipment so we should have had a 10% increase but thanks to Mr Behm we have worked together to absorb it. I can't guarantee that the next shipment won't cost more but can tell you that it will again be fair! Barry O'Speedwagon, pilko, chokkidog and 2 others like this. I haven't been able to find anywhere in the US that is advertising them... able to flick me a link? Roaster price in the USA will be a "best guess" at the moment as their shipment hasn't arrived yet. When they are available Boyds, Roast Masters, and Sweet Marias should all get them about the same time (at my best guess). Ah, thanks so much Andy, at least I know who to keep an eye on. Seattle Coffee Gear say they will have them in stock by the 17th of this month. Won't be the plus. My previous post was correct. Should be a hoot of a video when they eventually get their hands on it though (though I think I'll turn the volume down).